"Blend, blend, blend! 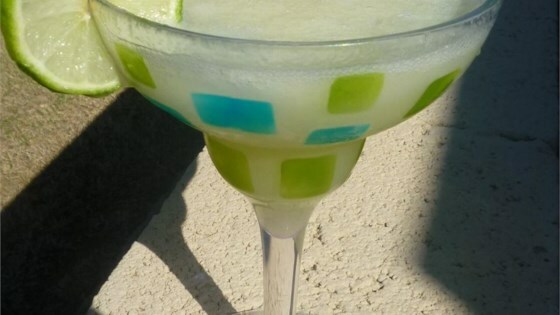 These margaritas are great for hot summer days, as they melt slowly staying nice and COLD! Serve with or without salt. If too tangy for your taste, cut back on the limeade." My husband and I really liked these. For those who aren't sure; a jigger is a shot. These are a bit on the strong side so beware! My husband has been using this recipe for years, however he substitutes the ice cubes for frozen strawberries that were fresh out of our garden. Awesome! what makes this recipe a five star is adding a can of beer to the mix at the end. this cuts the sweetness of the limeaide and really kicks it up another notch. try it , you'll like it !!! We use 6 oz. Tequilla, 2 oz. Triple Sec and toss in 1 - 2 oz. Orange Juice to take out the 'bite'. This is the BEST margarita recipe out there! WOW!!! What a great recipe. When it says with a bite, it's TRUE!